Today's stitch is a sweet little thing that adds a tiny pop. The stitched sample uses ThreadWorx Overdyed Floss (gray lines) and Kreinik Metallics Fine Braid (#8) (yellow lines) on 13-mesh. This stitch would make great water with Petite Silk Lame (gray lines) and a Kreinik Metallics Fine Braid (#8) (yellow lines). It would make a cute ground cover with Treenway Tranquility (silk perle) (gray lines) and Soie D’Alger (yellow lines). 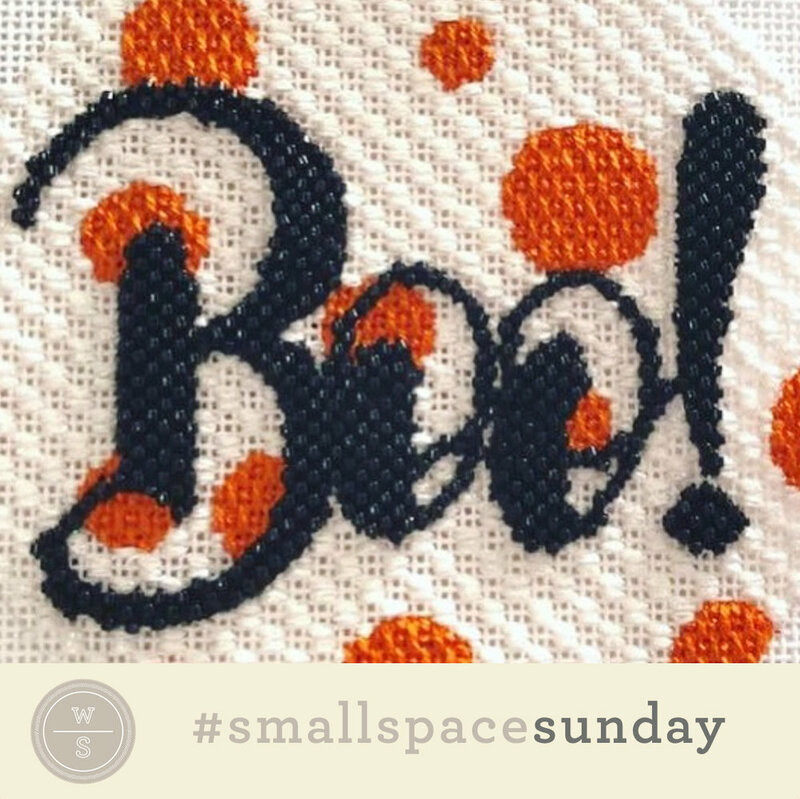 Today's #stitchingsunday takes us back to my second #smallspacesunday post. Today’s visit down Memory Lane illustrates how this great small space stitch can be used in larger spaces as well. The stitched sample is from the Aviva Floral from a recent embellishment event. I wanted to make the geometric borders interesting yet wanted the eye to go to the flowers. So, I divided the shapes into four with intriguing borders and added Reverse Basketweave to the quadrants. (And my student was very open to all of the above). It was a fun way to break up the individual shapes. The only thing missing from the stitched sample is a single bead in the empty intersection in the middle. And, before I go, just another reminder that this is one of my favorite glass stitches. 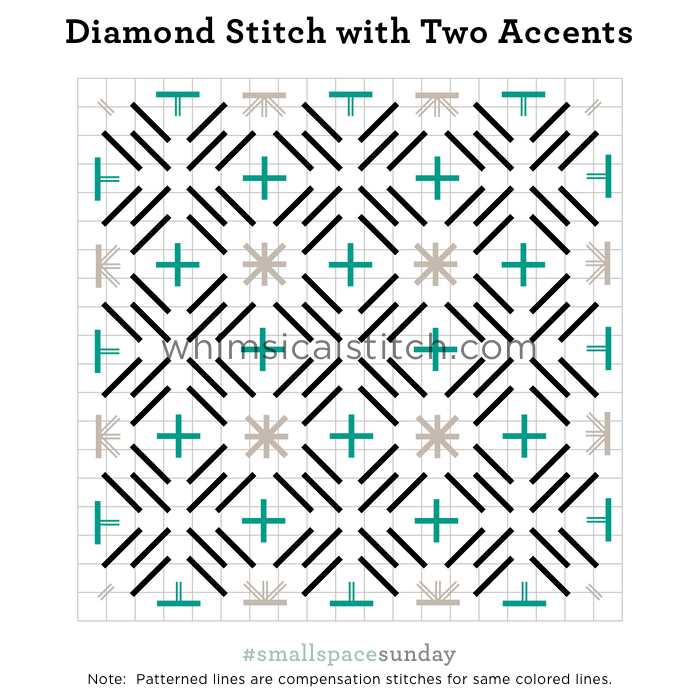 Today's stitch is a cute little combo of two easy small space stitches, creating a singular adorable pattern. The stitched sample uses Vineyard Silk and Neon Rays+ for a cap from a cute little Santa from another new Stitch Concept, Santas on a Shelf. I especially enjoy the texture that both stitches provide. I would love to see this used for a small tree with virtually any overdyed matte thread (silk floss, cotton floss, perle cotton, wool, single strand silk) for the gray lines with a solid matte thread for the accent (aqua lines). It would be great for a distant hill or field with the same combo. Clearly, it makes cute clothing. It would be a darling dress with Splendor or Soie D'Alger with Treasure Braid as the accent. If you want to really dress up the dress, consider a bead instead of the Cross Stitch for the accent! 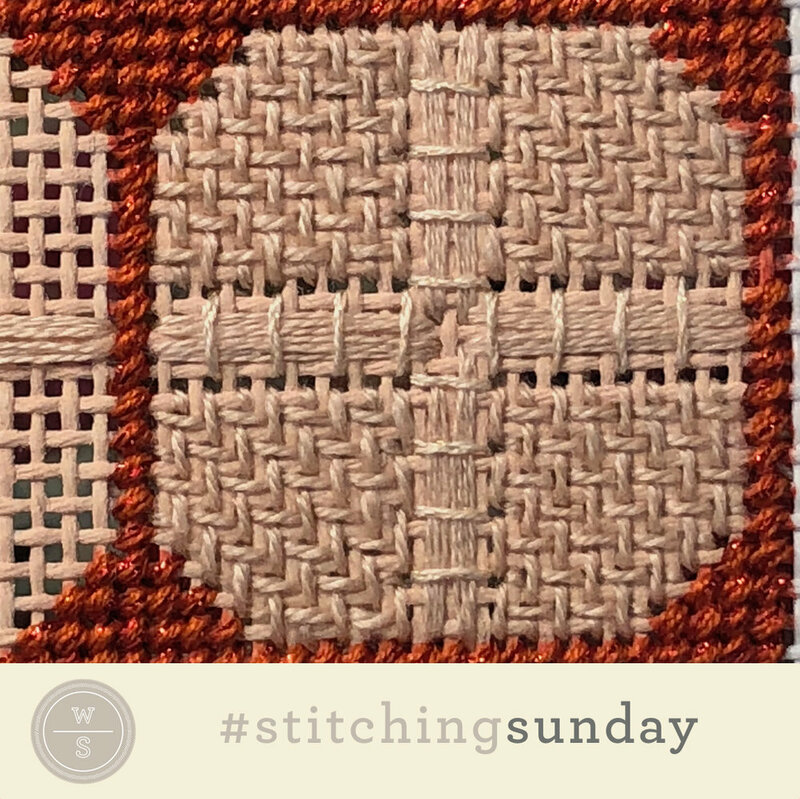 Today's stitch is an obvious variation on a go to stitch in my stitching circle. It's a really subtle variation that makes the stitch go even faster. Win win! The stitched sample is me playing with two plies of Impressions and Kreinik Metallics Tapestry Braid #12 on 13-mesh. 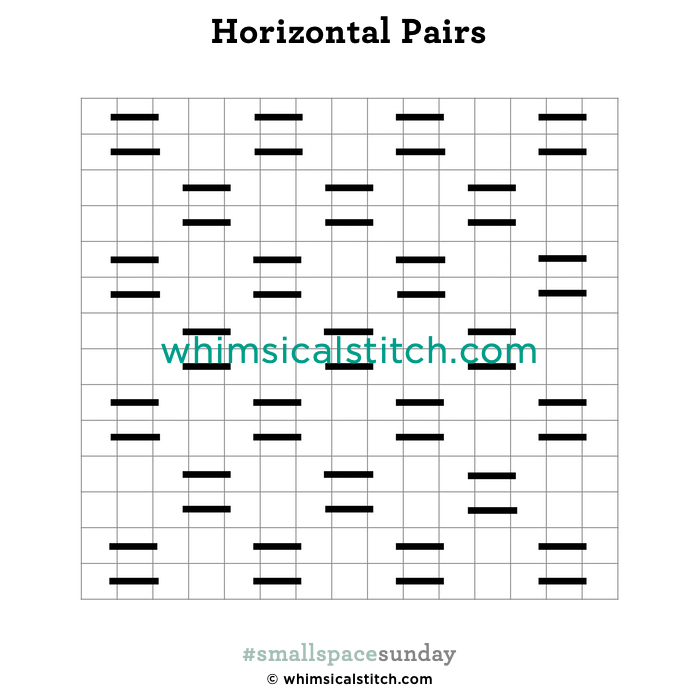 The right side includes a small Cross Stitch in the middle of stitches on the horizontal row. That could easily be a bead or a French Knot. This stitch leaves more room for shading to show through than its cousin. This is a stitch for all seasons. It would make great tree leafy greenery as well as tree trunks. Roof, floor, wall...virtually any architectural element. Clothing is also an obvious use for this stitch. I would love to see it as a Christmas stocking hung by the chimney with care. I think you get the idea. I lifted my thread commentary from the original post because it is a good reminder about thread weights. The cross stitch over one row condenses the stitch and adds a small level of bulk. If you do not want that added texture, your thread choice should be lighter than you normally use for the specific canvas size. 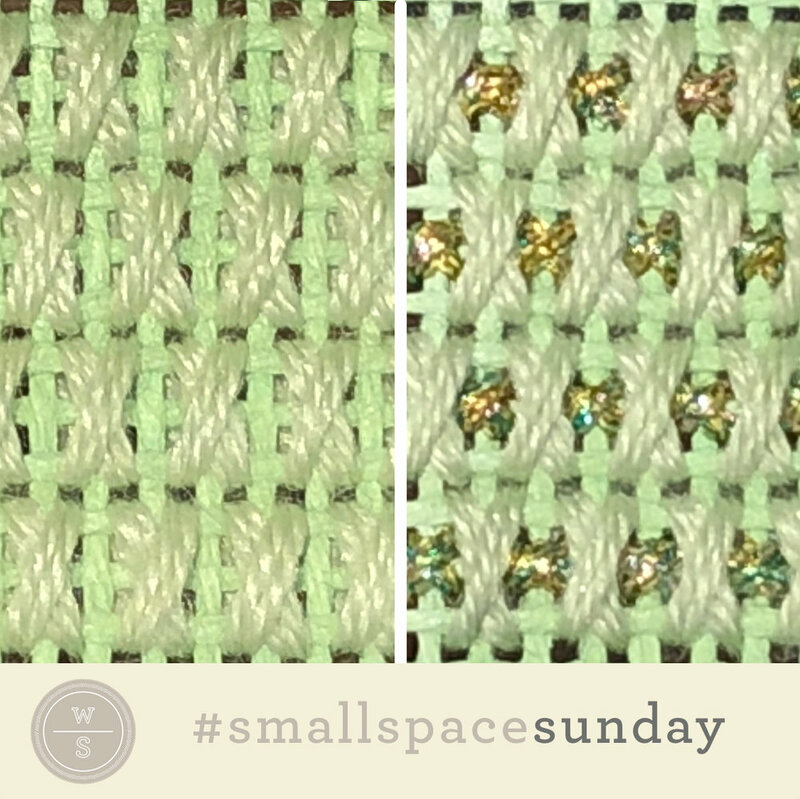 As an example, I like to use DMC Pearl #5 or Kreinik Metallics Fine Braid (#8) or Tapestry Braid (#12) on 13 mesh. Elegance or 4-ply floss is a good choice for 18 mesh. Truth be told, just last night, I used this stitch with a 4-ply floss on 13 mesh because 6-ply floss added way too much bulk for the stitched area. It was a great reminder that there are guidelines in needlepoint, but you need to let your eye tell you what the right thing to do is. Today's stitch is an ode to short, powerful, and surprising. Kinda like my dear friend, Gina(bean). She's all kinds of short and awesome, just like today's stitch. I think the technical name is Alternating Diagonal Mosaic, but I know it as the Ginabean. The stitched sample is Soie D'Alger with Entice for the accent. Two things happened on the way to the stitched sample. First, I really liked the stitch without the accent. But, I also love it with the accent! So, your stitched sample is both. Magic! This stitch would make a great small almost anything. The diagram includes a bead; the stitched sample uses a Cross Stitch in lieu of the bead. The bead version would make fantastic water, angel wings, small dresses or aprons, somewhere where you may want a little extra pop or extra added femininity. I see the Cross Stitch version as more multi-purpose. Sure, I would use it for any of the items I mentioned for the bead as well as clouds, receding landscape, tree leaves, roof, water, angel wings, small dresses or aprons. I think you get the idea. Today's stitch packs a lot of interesting detail for a small stitch. And it's fantastic. The stitched sample uses DMC Floss and Kreinik Metallic for a roof on a small house from a Melissa Shirley vintage Halloween village. The symmetry makes it a perfect roof stitch. The stitched sample used the same thread (the black Kreinik) to fill the open 2X2 intersections. Using two different threads for those intersections, as the diagram illustrates, offers a bunch of fun ideas. Consider it for a small coat or dress with Soie D'Alger for the black lines, Entice or Kreinik for the gray lines, and Petite Silk Lame for the turquoise lines. Another idea is to combine Gloriana Lorikeet for the black lines, Straw Silk for the gray lines, and Vineyard Silk for the turquoise lines. One last thought is to replace the gray lines with a bead and this could make a great small water stitch. You can have a lot of fun with this.